Which came first, video or the game? The story behind Quantum Break is as interesting as the game itself. Introduced at the Xbox One reveal event in May 2013, the first unveiling of Quantum Break painted it as this nebulous think-piece of a game that promised TV-quality, live-action video inside of a sci-fi, third-person shooter. To be honest, it sounded too tricky to pull off – or at least pull off in a way that enhanced the game rather than tack on an extra hour of video most gamers would want to slam their thumbs on the skip button to get through. 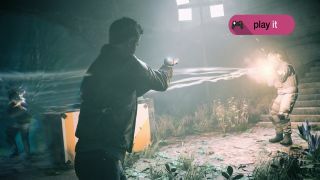 No one ever said explicitly that it would be ready for the Xbox One's launch in November of that year – clearly, it wasn't – but Remedy wasn't exactly straightforward about the game's release date, either. Whatever the reason was, I'm glad they waited. Had it been rushed, Quantum Break could've been an absolute train wreck of disjointed narratives and confusing motives. But, as it stands, the gameplay and video work in tandem to deliver something most games never achieve: cohesion. What I mean by cohesion is that the characters helping you, the often forgettable side characters in game who are used to get you from point A to point B, become real people. Both in a literal sense (Quantum Break's live-action video cast includes Aiden Gillen from Game of Thrones, Shawn Ashmore from X-Men, Dominic Monaghan from The Lord of the Rings and a half-dozen other famous actors and actresses) and in a figurative one. Without live-action video, you likely would not have cared about Liam Burke, an ex-military soldier who's been hired by the shadowy Monarch Solutions organization to take care of problems, or Charlie Wincott, the hacking savant who starts off selfish and either stays that way or has a change of heart, depending on the decisions you make. Without it, the only person you'd truly be able to know would be the main character, Jack Joyce, the brother of the enigmatic physicist who made time travel possible. And, as a result, hurled the world into chaos perpetrated by Aiden Gillen's character, only Joyce can pick up the pieces and stop time and space from unraveling completely. These characters are what help Quantum Break rise above mediocrity. Without the exhaustive (but entertaining) narrative for each and every character in the game, all you'd have left is a routine third-person shooter with some rough textures, jittery animations and a handful of bugs. But, before I dive into the heady story, the video sequences and the characters that will swallow up the next 10 or so hours of your life, let's discuss how Quantum Break plays. You'd be forgiven for not knowing what the gameplay of Quantum Break looks like. It's not something that's been talked about – or shown – as much as the game's cinematic sequences have. If you can, imagine Quantum Break's gameplay as a combination of the game's predecessor, Alan Wake, and Microsoft's Gears of War franchise. It's a cover-based shooter with a few tricks up its sleeve to keep combat as interesting as possible. These tricks include slowing down time all around you, teleporting from one place to the next and stopping time completely in a small area. They're all upgradable to last longer or affect a larger area, and you'll need to use them in conjunction with more traditional weapons – handguns, shotguns, submachine guns and the like – to kill Monarch's near-infinite supply of well-equipped footsoldiers. The combat that ensues is enjoyable at first before growing monotonous later. It might be the least enjoyable part of the experience which, depending on what kind of game you're looking for, might make Quantum Break a better title to rent than it is to buy. In between combat segments are time manipulation puzzles that see your character changing the state of objects – either from pristine condition to rusted and worn away or vice versa – to break into a research center, break into a secret underground base or break into a soiree that then leads to another secret underground base to break into. Seriously, almost every mission is about you committing breaking and entering. Traveling around the world in this way breaks up the monotony of near-constant firefights, and the levels are packed with collectible objects that further enhance the story. Close to a third of the game will be spent in firefights where you'll need to use time to slow down enemies or stop them completely, while another third will be spent solving traversal puzzles. The final part, as I mentioned before, is spent watching in-game videos. OK, now I can attempt to talk about the story. I say "attempt" because, just like Alan Wake, it's pretty heady. The plot revolves around three characters: Jake Joyce, his brother Will and their childhood friend turned power-hungry, mad antagonist Paul Serene. In the game's opening act, we learn that Will, a prodigal physicist, has created a time machine that he intends to use for the good of humanity once it passes the proper tests. Serene, not so altruistic or patient, wants it up and running sooner rather than later. In order to speed things, up he drags Will's younger brother Jack into the mess to hijack his brother's time machine. As you might expect, nothing goes as planned and time is inherently more complicated than any mortal can understand. Paul gets locked in the machine. Jack is confronted by his older brother who barges into the lab too late to stop the events from transpiring (despite pre-existing knowledge that it was going to happen – because time travel). And then future Paul shows up with the intent of killing Will. What makes future Serene so power-hungry and mad is that he's seen the end of time itself, a place where objects are stuck in a zero state and otherworldly beings hunt anyone who happens to live alongside them in the fourth dimension. He aims to prevent the end of humanity by killing Will and taking a powerful preventative device called the Counter-Measure from his possession that he'll then use to save a select few scientists in hopes of surviving the end of time. Not so bad, right? But, toss in six relatively well fleshed out side-characters, and things start to get hairy. You see, Serene isn't the only person who's seen the end of the world. There's another who wants to prevent the end of time from happening by doing the only logical thing: killing Serene before he starts the time machine. I won't disclose names or dates in attempt to preserve the joys – or trouble, depending on how you look at story-heavy games – of deciphering the story for yourself, but while the story itself is tricky to follow, it's helped immensely by live-action video and Junction Points, binary decisions you'll make as Paul Serene that will reshape the rest of the story. I feel somehow guilty using the words "binary decision" when talking about Junction Points. Yes there are only two choices, but the options aren't as simple as "being a good guy" or "do something bad." There are four Junction Points in Quantum Break between each of the game's five acts, which predicate the live-action action sequences and therefore the story. The decisions you make will mean the difference between life and death, who sides with you and who will align themselves against your cause. It's not always apparent what effect your decision will have down the road, and ultimately gives the game more replayability than the generic third-person shooter. But, Quantum Break's biggest strength, and by far its biggest achievement, are the videos themselves. The 20-minute-long videos allow Quantum Break to tell more about the characters' backstories than traditional cutscenes can. Jumping between scenes feels more natural in a video format than it does in CGI and, in turn, adds more believability and context to the tough-to-digest plot. All that said, if they existed outside of the game, the writing in them wouldn't be as interesting as in, say, an HBO series, like Game of Thrones, or Netflix's House of Cards. They're more like an A-grade SyFy channel series than a fully fledged TV series, but they do add an admirable, new layer to the standard game experience. To that end, while Remedy Entertainment's Alan Wake tackled psychological thriller books, Quantum Break takes on two new and different genres (sci-fi, video) and does so in an impressive way. It's a neat combination that works in tandem to deliver a better experience than either could on its own. The ending, like the game as a whole, is something you'll appreciate … even if you don't understand it completely at first. If your Xbox One has been dormant for some time, Quantum Break is the jumpstart it needs to get going again.